I’m from Iowa. We like our fair share of bacon here. 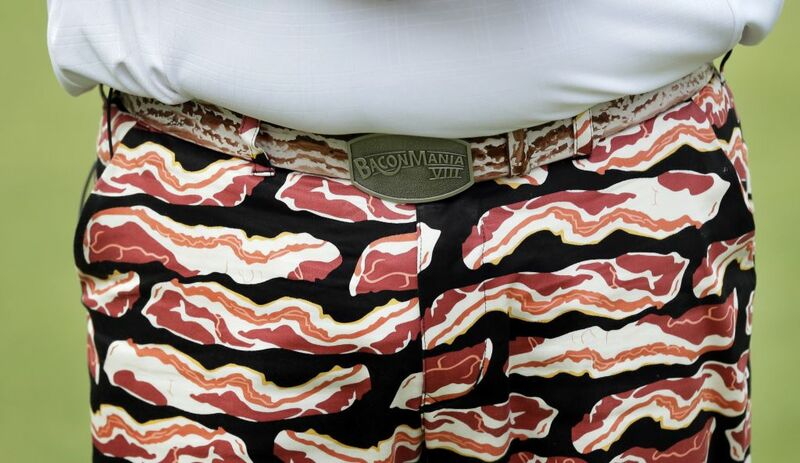 Last week, professional golfer Mark Calcavecchia, won The Principal Charity Classic wearing bacon-patterned pants. My local donut shop offers bacon maple donuts. At the Iowa State Fair you can get a Bacon Mac N Cheese as well as a Chocolate Covered Chunky Bacon Maple Nougat On-A-Stick. Des Moines even has an exponentially growing annual festival called Baconfest. And of course there are plenty of bacon related t-shirts for sale like these shirts from Life Is Good, Busted Tees and Think Geek. A few months back, a Lighten Up Gear fan suggested I produce a God Over Everything t-shirt. I’ve seen a few of those around as well as Bizzle’s God Over Money t-shirt, but that simply isn’t our style. 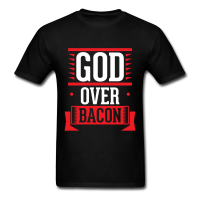 Being that we’re from a bacon-rich part of the country, we thought it would be more appropriate for us to come out with a God Over Bacon t-shirt now available in our online shop. While I don’t know how it would be received at Baconfest, it might make for a good conversation starter…that’s for sure.